You joined Rob for his first ever youth expedition 12 years ago. What inspired you to come back for a second time? In the expedition 12 years ago, I was totally inspired by the beauty of Antarctica, by Robert Swan, and by the whole team. It was a truly amazing experience, because at that time we (in Vietnam) did not have internet, we did not have much information from the outside world. Everything I saw or heard in that trip really changed my thinking, my perspectives at the world, and took me to a great level of awareness about the environment that I had never had. The trip was so inspiring, that it made me quit my current job to switch to working for the development and environmental field. For the last 12 years since I came back, I have been giving talks, and working on numerous environmental projects in the country, but somehow I still felt lonely. 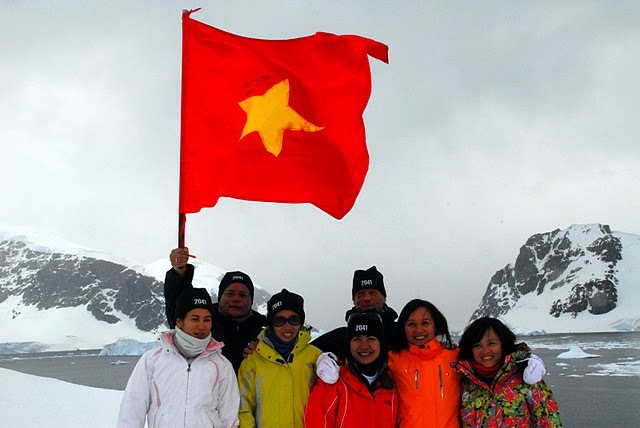 Being the first and only Vietnamese person to set foot in Antarctica is “cool”, but later I came to realize I needed more than that. I want more people to have the same experience as I did, so I can have more friends to work on the mission together with me. That’s why I decided to come back with a whole team, Team Vietnam, because I know that together, we can make a bigger impact. What is your dream for Team Vietnam? We have been talking about what we are going to do when we come back. Six of us have different jobs, live in different communities, so we will be able to deliver the message to totally different audiences. One part of the plan is to set up a website in Vietnamese, to inspire people to change the way they think, and take small changes in their daily habits, to become more environmentally friendly. The problem in Vietnam is not that we consume too much energy as the developed countries do, but with bad habits, we waste a lot. I really hope we can change that with our presentations, the website, and through working with the local media. That’s the least we can do. Based on the intense experience that you have had, what is your message to young people in India? I just would like to say this: you are going to be the leaders of your country. Don’t make the same mistakes as they did in the developed countries. Be aware, be motivated, and be ready for any opportunity that might drop on your head any time, such as an expedition to Antarctica like the one we are having. However, you don’t need to go to Antarctica to be able to save the world. Anyone can do something good for the environment. The warrior is already in you, so be proactive, start to think green, act green, and remember, Asia will be the solution to the world’s current problems. So inspire, and be inspired! The future of the world’s second biggest country is in your hands. Laurie is an extreme adventurer whose feats include skiing for 91 days from Russia to Canada through the Geographic North Pole, skiing and sled hauling to the South Pole, traversing the ice caps of Greenland, Baffin Island, and King George Island in Antarctica, and numerous other polar region expeditions. As a runner he also goes to extremes, including having run 100 km in 8 hours, over 200 km in 24 hours, 600 km in 6 days, and 10 marathons in 10 days. He lived on Baffin Island for 13 years where he learned the survival skills of the Inuit (Eskimos) and speaks their language. 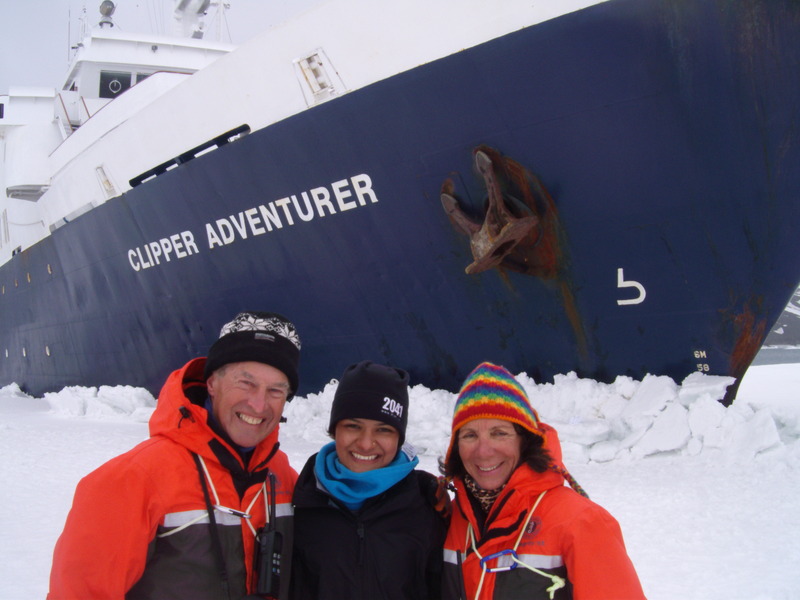 Since 1993 he has made over 90 ship based trips to Antarctica and more than 50 to the Arctic as an expedition leader and lecturer. In recognition of his international contribution the Canadian Government has honored Laurie with the Order of Canada. What is your relationship with the Polar Regions? I have lived in the Polar Regions most of my life. As a boy I grew up in the Shetland Islands, north of Scotland, so learned to love the sea, the isolation, the outdoors, wildlife and all of nature. A lot of my early reading was about explorers and after I first learned about the Inuit (Eskimos) I knew I wanted to meet them. I ended up living with the Inuit on Baffin Island for 13 years and still live in the Canadian north although now in the sub-Arctic. What has been your inspiration? Why have you chosen this path in life? As I mentioned my early heroes were explorers and mountaineers – Magellan, Cook, Scott, Shackleton, Peary, Nansen, Amundsen. But my inspiration was probably more taken from some of the early missionary explorers who worked for justice, such as Livingstone in Africa, and Wilfred Grenfell in Canada. As a result I first worked with the Inuit as an Anglican minister, and continued to go on expeditions in the Arctic while living there, and later moved into full time work in the adventure industry. What has been the most challenging expedition you have been a part of? The hardest expedition both physically and mentally was the Polar Bridge Expedition in which we skied from central Siberia (Cape Arktichesky) to Canada (Ward Hunt Island). This took 91 days from shore to shore over a thin crust of frozen ocean that is always moving under the influence of wind and ocean currents. It is rarely flat but has large pressure ridges and also areas of open water. As we did this in winter it was also very cold, often between -40 and -50 degrees Celcius. 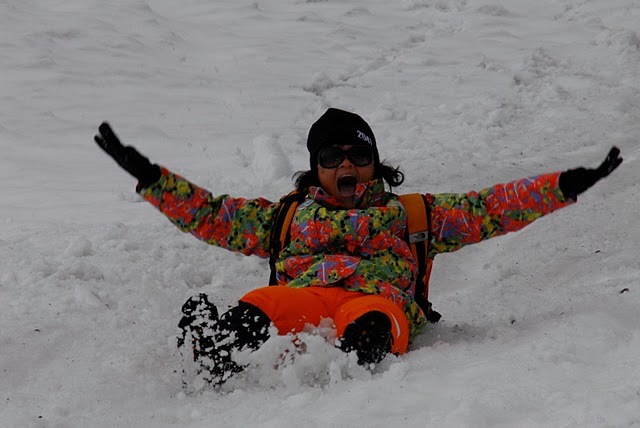 Could you share one of your best moments while exploring Antarctica? One of the best trips I have done was skiing the length of King George Island pulling sleds, but to pick out best moments is difficult. Many of the highlights have been watching the response of people we have introduced to Antarctica and to see their minds open to new ideas and possibilities. What have been some of the tougher moments in terms of navigation and zodiac operations on the IATE 2009? We haven’t had any very difficult navigational challenges, but we did have two tough zodiac operations. When the team camped on Hovgaard Island we knew the forecast was for winds increasing overnight to around 30 knots. 30 knots is normally our cutoff point for driving zodiacs because when a driver is alone driving into the wind there is a chance that the wind can get under the zodiac and flip it. Because of the figuration of the islands the wind seemed to be funneled and when it came time to pick up the campers it was blowing over 40 knots. Fortunately it was slightly behind while driving to shore empty and coming back against the wind the zodiac was full, so there was no danger of flipping. But I was very relieved when we had everyone safely back on board and all the zodiacs safely back up the hook and lashed down on deck. The second time was at Almirante Brown in Paradise Bay. We landed in almost flat calm conditions with a few patches of brash ice around, but after an hour or so the wind began to pick up from the north. Soon it drove the floating ice right onto our landing area. The point of land where Robert and the camera team landed became totally surrounded and they had to walk to the station where we were loading everyone as quickly as we could. The zodiacs were completely hemmed in with ice but it was not too closely packed and we were able to push our way slowly out. By then the wind was strong and we returned to the ship in choppy waves with spray occasionally breaking over the boats. The coolest part about being in Antarctica was of course, the continent itself. No words can describe her majesty. The feeling of standing at the top of a mountain and looking out at an endless expanse of blue white ice dotted with the black and orange of penguins, is pure magic. 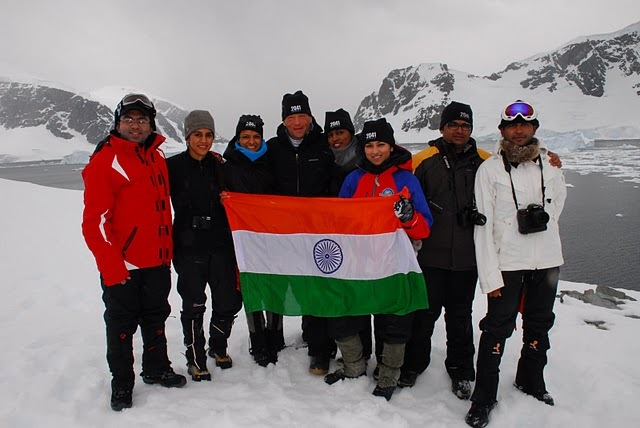 The other cool part about being in Antarctica was the people I met on the expedition. Two weeks of exploring the continent were made incredibly fascinating, new and intense by my fellow expeditioners and team leaders. I would like to share some of these brilliant stories; of lives lived with courage and humility, risk and focus. Antarctica is a whisper, the most marvelous and extravagant of whispers; as it entails the most pristine of beauties, it can suddenly and without notice, turn into the most hostile of environments. It’s a whisper that let’s you feel what heaven’s like, as a whale dances peacefully right besides you. Timeless, as the most magnificent of sceneries surrounds you, with all possible combination of blues and whites; it’s a poem. It’s a whisper as it diffuses and disappears before your eyes, before you even notice. It thus forces you to be present, as each moment might be your very last chance to enjoy such beauty. And yet it inspires you to look for, to imagine and to generate other moments of connection with nature of such beauty, so as to attempt to resemble them in the future, to live once again or for the very first time what these words I write cannot describe. It’s a whisper that goes so fast that it is truly irrelevant if you’ve been here or not. It is a cry to live life as presently as you can. It reminds you, and does no more than that, of the fragility of every moment, of how these moments can entail the most radical of beauties or be as harsh as you can imagine. Live life to the fullest. 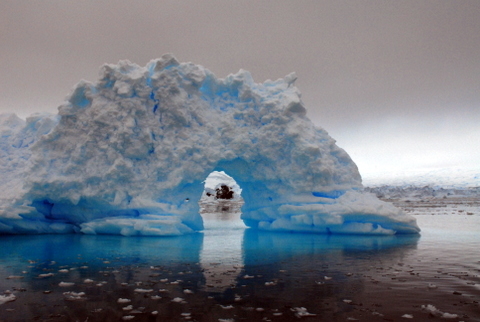 Antarctica cries out loud just that. Look for such beauty on every sunset, on every walk on the woods, on every drop of water in a calm lake or a wild river. It does nothing more than remind you that you are nature, and that you have been longing to reconnect with this reality that lies within you. In the prelude to the upcoming COP-15 meeting in Copenhagen, the expedition team implores our respective leaders to learn from the example of the Antarctic Treaty and explore how this policy mechanism can be used as an example of the type of international cooperation needed to combat our current environmental crisis. The Antarctic Treaty, signed 50 years ago to the date in Washington DC, is a shining example of international cooperation to preserve a piece of our planet for science and peace. While the Antarctic region had previously been the site of much commercial and political conflict, the Treaty allowed nations to move past a seemingly irreconcilable disagreement in favor of a larger purpose and ultimate goal of preservation. Although the issues of sovereignty still remain, the Treaty allows nations to focus on the protection of Antarctica while simultaneously protecting their national interests by placing the issue of sovereignty in abeyance. Robert Swan OBE will be bringing this message to global leaders at the COP-15 meeting in Copenhagen later this month. 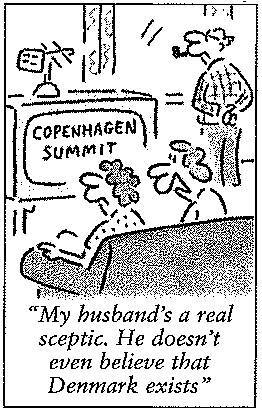 His yacht, 2041, will be moored in Copenhagen. 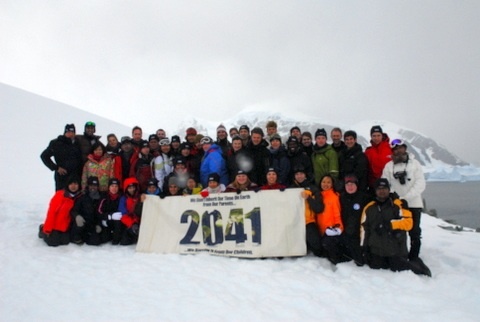 About 2041: 2041’s mission is to build on Robert Swan’s lifelong commitments by inspiring and educating young people, teachers, and business leaders on the importance of preserving Antarctica. To do this, 2041 raises awareness on the issue of climate change and encourages people to adopt sustainable, renewable energy practices so that Antarctica will never be exploited for its resources. For further information, contact Robert Swan OBE at: rswan@2041.com or Click here!